Background: Tuberculous (TB) osteomyelitis of the scapula is a rare clinical entity. Bone TB result from hematogenous or lymphatic dissemination of the bacilli from a primary focus of lungs, lymph node or gut. Isolated bone involvement without any primary focus and without history of TB contact in a well active young patient raises question about its mode of spread to this unusual site like scapula. The isolated involvement of this flat bone without any primary focus confuses the surgeon with other pathology and as a result there is always delay in diagnosis. Possibly, the low specificity of the clinical condition and the limited suspicion with regard to TB as the cause of osteoarticular pain are responsible for the delay in diagnosis . 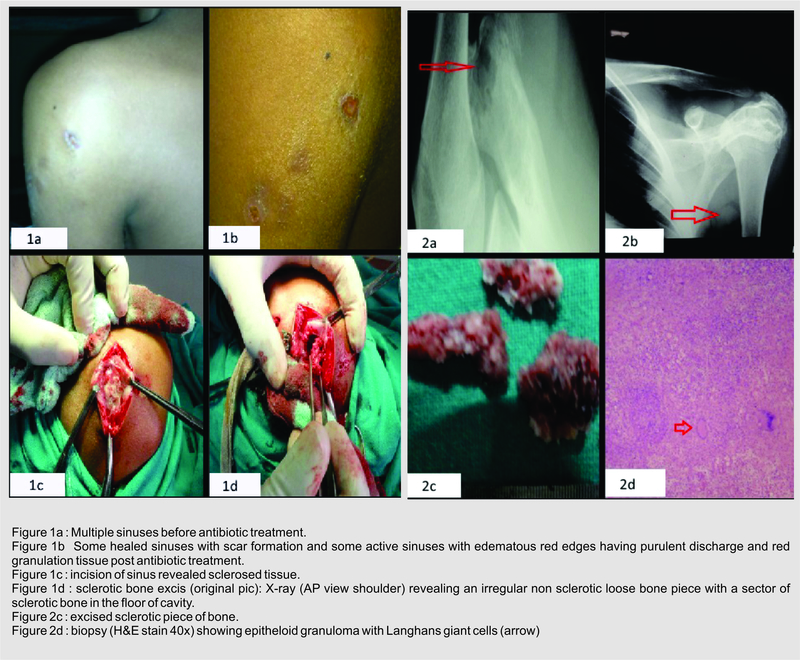 We discuss a rare case of tuberculous osteomyelitis with superadded bacterial infection of acromion process of scapula without primary TB in a 16yrs male patient. The delay in diagnosis of the case may be because of nonspecific complaints, radiographs mimicking pyogenic osteomyelitis with no history of trauma, no lung or nodal involvement by tuberculosis. Tuberculous osteomyelitis of the acromion process of scapula with superadded pyogenic infection has not received much attention in the literatures which makes us to present it. It’s a rare and severe condition that can leave to serious sequelae if not detected and treated on time. Keywords: Tuberculous Osteomyelitis, Scapula, Acromion process. Atuberculosis, including skeletal tuberculosis, is an ancient infection based upon evidence from archaeological remnants [1-4]. Typical features of spinal TB have been identified in Egyptian mummies dating back to almost 4000 BC . Mycobacterium tuberculosis was revealed by DNA analysis in a vertebral lesion of a young girl who lived about 1000 AD . TB is the major cause of skeletal infection in the developing countries . Skeletal TB accounts for 10-35% of extra-Pulmonary TB and only 2% of all cases of TB . Resurgence of tuberculosis with rising burden of acquired immunodeficiency syndrome has created a major problem before health professionals . Their atypical presentations at unusual sites lead to delay in diagnosis or misdiagnosis . TB can disseminate hematogenously to almost every organ after a primary infection or reactivation of latent foci, occurring more commonly in an immunodeficient patient . The pathogenesis and source of latent foci and subsequent routes of dissemination are incompletely understood, but three reported theories include spread as a late complication of pulmonary tuberculosis, reactivation of latent foci formed during hematogenous or lymphatic dissemination of primary tuberculosis, or direct extension from mediastinal lymph nodes . Tuberculosis is the major cause of skeletal infection in developing countries . Tuberculous osteomyelitis involving the flat membranous bones is extremely rare . Tuberculosis of scapula is also very rare, only a few cases of tubercular osteomyelitis of scapula have been reported till date and all these were associated with other forms of tuberculous osteomyelitis . While the most common site of osseous involvement is spine, followed by femur, tibia and small bones of the hands and feet, any bone can potentially be affected . Most common presenting symptoms of Tuberculous osteomyelitis are nonspecific pain and swelling . So, appropriate imaging with CT or MRI should be pursued when plain radiographs are normal . Clinical symptoms may precede radiological changes, which are varied depending on the progression of osteomyelitis and include osteoporosis, osteopenia, bone lysis, sclerosis, periostitis or pathological fracture . Plain radiographs are often normal, but CT shows the extent of bone and joint destruction . MRI delineates abscesses better in the soft tissues, and highlights bone marrow involvement . A three phase bone scan has high sensitivity and specificity for osteomyelitis, but gives less anatomic detail and does not indicate the cause of infection . Gallium scans can be useful in showing other involved organs, but are also nonspecific with regard to the cause of infection and extent of damage . A needle aspiration or excisional biopsy is mandatory for histopathological diagnosis of osteomyelitis, because radiological findings cannot differentiate the cause of osteomyelitis, and sometimes may even appear neoplastic . The frequency of positive cultures is similar between both types of biopsies with approximately 85% showing acid-fast bacilli, but excisional biopsies are more likely to demonstrate granulomata and acid-fast bacilli . Very few cases of tuberculous osteomyelitis of scapula have been reported till date and all of these were associated with other forms of tubercular osteomyelitis . In the present case, no other focus could be detected. 16year male patient presented with repeated attacks of pain, mild fever on & off and swelling over lateral aspect of left shoulder (Fig. 1a) since 2years. Swelling used to burst open to discharge pus and occasionally small pieces of bone. The resulting sinuses healed with treatment by local doctors in 3-5 weeks. There was no history of injury, weight loss or cough. Local examination revealed multiple sinuses on lateral aspect of left shoulder, some healed sinuses with scar formation and some active sinuses with edematous red edges having purulent discharge and red granulation tissue. The acromion process was thickened, irregular, enlarged and tender showing wasting around the shoulder with painful restriction of terminal abduction of left shoulder. Blood investigations were within normal limits except mild increase in ESR-26 mm/hour. X-ray showed destructive lytic lesion at the tip of acromion without any periosteal reaction (Fig.-2a), irregular non sclerotic loose bone piece with a sector of sclerotic bone in the floor of cavity (Fig.-2b). After culture and sensitivity report specific antibiotics were started. After course of antibiotics, pain and swelling reduced. Purulent discharge changed to clear watery discharge, the edges of sinuses became thin, overhanging-granulation tissue became pale (Fig-1b). The skin surrounding the sinuses remained swollen and red. The clinical features of this sinus changed from pyogenic to tubercular, this forced us to go for biopsy (Fig.-1c, 1d & 2c) which revealed granulomatous tuberculous osteomyelitis (Fig.-2d). Patient was then treated with Anti- tuberculous regimn andleasion healed in 12 months. Osteoarticular TB constitutes only 1-2% of all TB . Tuberculous osteomyelitis of the scapula is a rare clinical entity. While, most common site of osseous involvement is the spine, followed by the femur, tibia and small bones of hands and feet, any bone can potentially be affected . 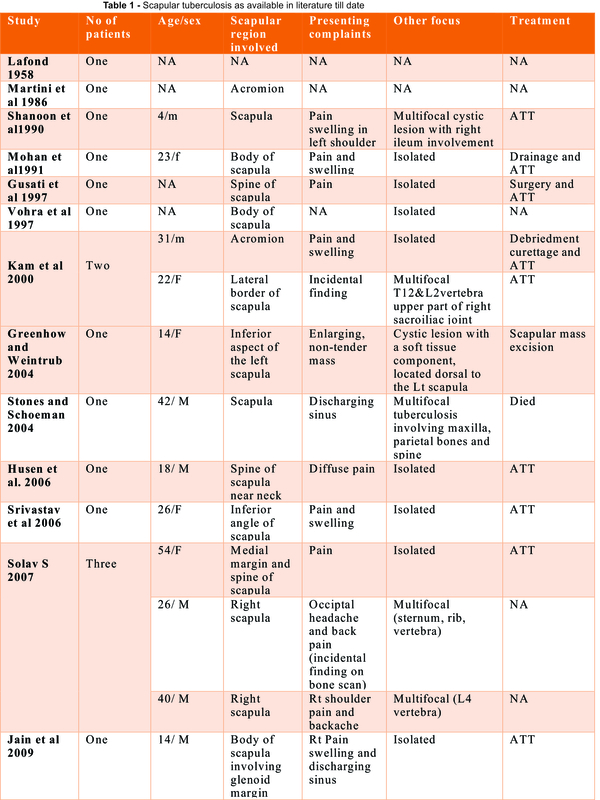 Solitary tuberculous osteomyelitis involving acromion with superadded bacterial infection is a very rare clinical entity, to the best of our knowledge till date the literature review shows only fourteen cases of scapular involvement, out of which only two cases (both had pulmonary tuberculous focus) shows isolated acromion involvement (table-1) . Most common presenting symptoms of Tuberculous osteomyelitis are nonspecific pain and swelling . Bone pain that does not respond to analgesic medications is characteristic of an infection like TB or a neoplasm . The lesions on radiograph are highly nonspecific and simulate pyogenic osteomylitis, fungal infection, metastasis, telengiectactic osteosarcoma, aneurysmal cyst, sarcoidosis, eosinophilic granuloma or chordoma . Differentiation of TB from all these differentials may not be possible without tissue biopsy . MRI-scan may be sometime deceptive . Morris reported that confirmation of musculoskeletal tuberculosis is solely based on identification of epitheloid granuloma and caseous necrosis or tubercle bacilli in fine needle aspirates or on tissue culture studies . Accordingly the present case was diagnosed on the basis of histological findings which revealed epitheloid granuloma. Culture report further supported the diagnosis. Clinicians should have high index of suspicion for diagnosing this rare presentation of tuberculous osteomyelitis of the acromion process of scapula without any other prior pulmonary symptoms and signs. Diagnosis is often delayed due to lack of awareness, insidious nature, lack of early radiographic findings persisting symptoms and signs, especially when there is superadded pyogenic infection. 1. Vasa M, Ohikhuare C, Brickner L. Primary sternal tuberculosis osteomyelitis. A case report and discussion. Can J Infect Dis Med Microbiol 2009;20:181-4. 2. Tripathy SK, Sen RK, Sharma A, Tamuk T. Isolated cystic tuberculosis of scapula; case report and review of literature. J Orthop Surg Res 2010;5:1-5. 3. Fabiana CS, Andre LA, Lais AS, Figueiredo JL, Rosana RM, Lilian MM, Haiana CS. Rev Soc Bras Med Trop 2013;46:249-51. 4. Ramakant AM, Fernandes M, Chanabasappa C, Rao P, Ravikiran S, Prabhu S. Tuberculous Osteomyelitis of the Scapula- A Case Report. SEAJCRR 2015;4:1590-4. 5. Balaji G, Arockiaraj J, Roy AC, Ashok A. Isolated Tubercular Osteomyelitis of Scapula – A Report of Two Cases and Review of Literature. J Orthop Case Reports 2013;3:7-11. 6. Srivastava P, Srivastava S. Tuberculosis of the scapula. Indian J Surg 2006;68:27-9. How to Cite this article: Gore SJ, Kanade US, Sadrani VJ. Tuberculous osteomyelitis with superadded pyogenic infection of acromion process of Scapula without a primary focus. Journal of Trauma and Orthopaedic Surgery.April – June 2017;12(2):31-34.